Grant talks about finding inspiration as a young dancer, his first professional performances in England, and some of his many collaborations with choreographer Frederick Ashton, who created many roles for Grant. For most of the interview, Grant provides a detailed description of one of his signature roles: Petroushka, the Russian comic puppet in Igor Stravinsky's ballet of the same name. Grant was born in New Zealand in 1925. He came to London in 1946 to study ballet at the Royal Academy of Dance (RAD). He became a founding member of the Sadler's Wells Theatre Ballet (now known as the Birmingham Royal Ballet) and danced many character roles for the company. In 1976 he became director of the National Ballet of Canada, and was still occasionally performing there at the time of this interview. In 2011, at the age of 86, Grant passed away. 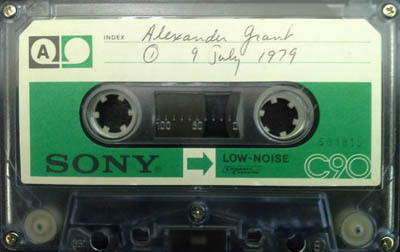 “Alexander Grant (published 1982),” Dance Dialogues: Interviews by Barbara Newman, 1979-Present, accessed April 25, 2019, http://dancedialogues.prattsils.org/items/show/52.